A cute unique twist on your ordinary flower clip! 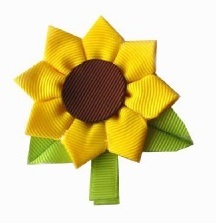 This sunflower clip is made from grosgrain ribbon. Attached to a partially lined alligator clip.